The National Council on Disability Affairs (NCDA) together with the Philippine Sports Association for the Differently-Abled (Philspada) recently held a national tryout for Women’s Wheelchair Basketball Team at the Philippine Sports Arena in Pasig City. Six (6) women with disabilities participated in the tryout pool conducted by head coaches for men’s and women’s wheelchair basketball Vernon Perea and John Rey Escalante of Philspada. These women include Patricia Camille Castro of Quezon City, Jean Delos Reyes of Las Piñas City, Leah Broqueza of San Pedro, Laguna and Kimberlee Dangayo, Cendy Asusano and Cecilia Nacero of Tahanang Walang Hagdanan. 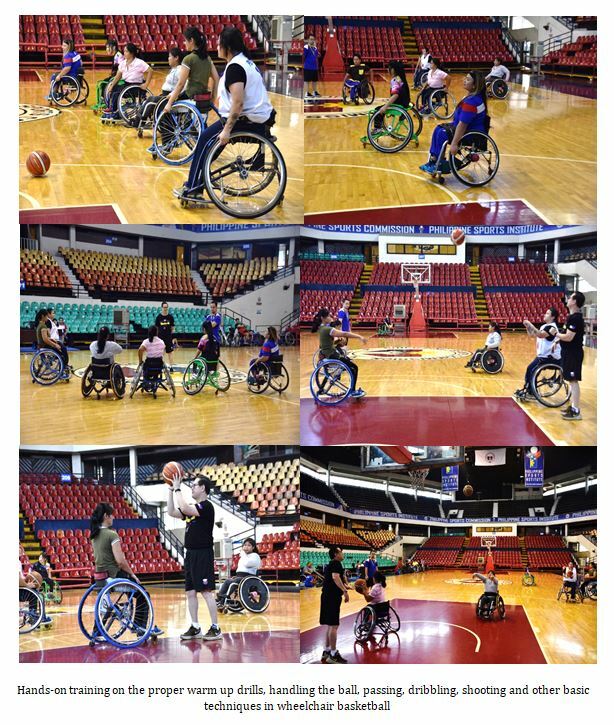 The trainees were introduced to wheelchair basketball, lectures and hands-on training on the proper warm-up drills, handling the ball, passing, dribbling, shooting and other basic techniques in wheelchair basketball. “We are hoping to form a competitive national team for women’s wheelchair basketball this year in time for the forthcoming international tournaments,” Perea said. The 2019 Women’s U 25 Wheelchair World Championships are slated on May 22-30 in Suphandburi, Thailand. Perea added that the Philippines will be hosting the 10th ASEAN Para Games in January 2020. The wheelchair basketball is included in the 22 sports in the ASEAN Para Games. Other sports include archery, athletics, badminton, boccia, cycling, football five-a-side, football seven-a-side, goal balljudo, power lifting, sailing shooting, swimming, tenpin bowling, table tennis, volley-sitting, wheelchair dance sport wheelchair fencing, wheelchair rugby, and wheelchair tennis. The Philippines last hosted the ASEAN Para Games in 2015, with the country finishing sixth in the medal standings with 19 gold medals. It is a biannual multi-sports event held after every Southeast Asian Games involving athletes with disabilities from 11 Southeast Asia countries.